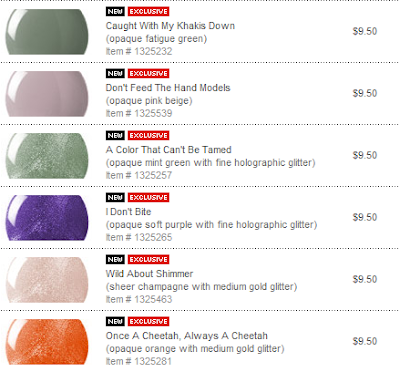 I just spied a new collection on Sephora.... the Safari Luxe Collection. Inspired by animal-print fabrics, snakeskin pumps, and stacks of gold bracelets, Sephora by OPI's new Safari Luxe collection takes after one of the hottest trends to hit the runways: safari chic. "We came up with a nail lacquer collection as stylish and fun as the trend itself," says Suzi Weiss-Fischmann, OPI VP and Artistic Director. "And just like a leopard-print scarf spices up an outfit, each summery shade adds instant edginess to your wardrobe." I love Sephora by OPI polishes and am dying for this set.... but I need it like I need a hole in the head! Be strong Sasha! LOVING A color that can't be tamed!